Standing is a legal term that refers to the ability of a party to bring a suit in a court of law. 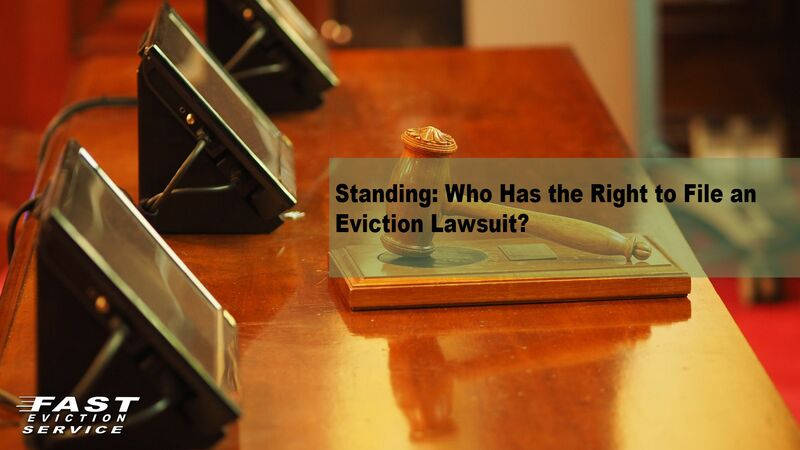 The issue of standing arises in eviction cases where the Plaintiff is not the original owner/lessor of the rental property. There is a concept in California Law that only a person who has an interest in the real/rental property may be the Plaintiff in an Unlawful Detainer case. This concept is called standing to bring the lawsuit. Of course, as with any general rule there are exceptions. The agent for the person who has title to the claim or property involved can sue on that claim if that person assigned his, her or its interest to the agent. As assignee, the agent would be the real party in interest (party owning the claim of right to possession) and thus entitled to maintain the Unlawful Detainer in his/her or its own name. While, there is no case on point holding that a landlord can assign his or her interest in an Unlawful Detainer action to an agent. However, the general law permitting the assignment of claims would provide legal authority for such an assignment. Thus, landlords should consider that, subject to exceptions specified in CCP §§ 1161 and 1161a, the sine qua non to maintenance of an Unlawful Detainer action is the existence of a landlord-tenant relationship. While the concept of assigning the right to bring in Unlawful Detainer action to the owner’s agent may draw an objection by the tenant or the tenant’s attorney a carefully worded trial brief or written argument should be able to overcome this objection. Moreover, though technically not the “real party in interest,” an agent would have standing to sue if the lease or rental agreement was entered into in the agent’s name. By authorizing the agent to enter into the lease, the landlord essentially assigns the interest in the property prior to the creation of the landlord-tenant relationship, making the agent the landlord. Arguably, under agency law, an agent might have standing to file an Unlawful Detainer if the landlord gave the agent written authority to sue and retake possession in the agent’s own name. Owners of rental property often confer management responsibility onto a property management firm and enter into a written agreement authorizing the firm to execute leases, collect rents, and recover possession from defaulting tenants. Pursuant to the above general rules the Unlawful Detainer complaint filed in the name of a property management must allege: (1) Its status (individual, partnership, corporation, etc. ; (2) that it is a party to the lease or rental agreement (or, assignee of the principal’s interest) (a) If suing as a party to the lease or rental agreement, that it executed the lease/rental agreement in its own name for the principal’s benefit pursuant to a management agreement with the principal, detailing the means by which the authority was conferred. Additionally, purchasers of leased property are successors in interest to the owner and may properly sue in their own names. They must allege their successor in interest status as a result of acquiring title to the property, but need not allege they have personally entered into a contractual relationship with the tenant.